With just 20 guest cabins, the yacht’s convivial atmosphere leads to a close-up experience of this unique world. On board, guests find delicious cuisine, faultless service and excellent facilities, including a Hut Tub, fitness room, bar and outside deck for al fresco meals, drinks, and sunbathing. As on all our vessels, your groups can expect top facilities and equipment, delicious meals, and safe and stimulating expert-planned expeditions on the islands. Scout the island sites for Big 15 wildlife in groups that average no more than 11-14 guests per naturalist guide which surpass the National Park standard, which permits up to 16 guests per guide. 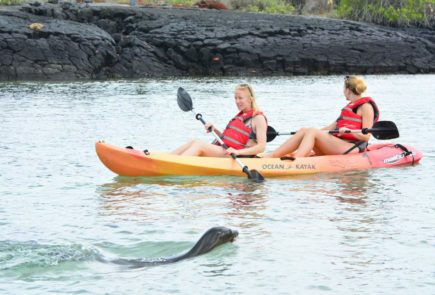 Explore the coast with your guides on our pangas, glass-bottom boat or kayaks, or get wet and snorkel. 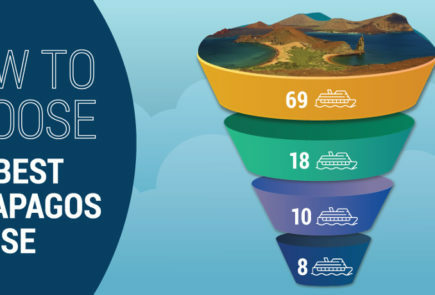 Free shore excursions natural history lectures and transfers in the Galapagos. Free transfers airport/hotel/airport for Galapagos cruise departures to major hotels in Quito and Guayaquil. Free consultations with our Medical officer, on call 24/7. * Internet connections onboard consist of 2 computer stations in the business center and wifi in the yacht’s social areas; due to the Galapagos’ remote location, internet connections are intermittent and low-bandwidth.